Get ready to kick the ball around at Fly Casino with an all star roster of Lionel Messi, Andrea Pirlo, Iker Casillas, Bastian Schweinsteiger and Wayne Rooney! 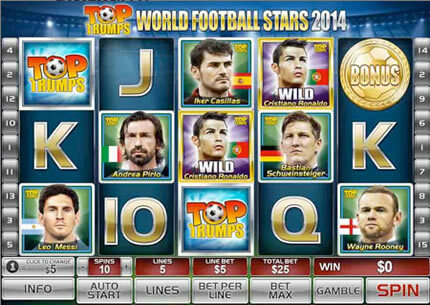 If you've played Top Trumps World Football Stars, then you'll enjoy this new 2014 version with a modern roster and game play. Get three or more of the Top Trumps scatter symbols anywhere on the reels to trigger ten free spins with an extra wild player that you choose! That player will then become an extra wild on the reels, multiplying wins by 4X. Get the gold medal bonus symbol on reels one and five to enter this bonus. You will be shown sixteen superstar players and all you need to do is pick three to reveal cash prizes. Super Monday! From 00:00GMT until 23:59 GMT, all members on their first deposit of $/£/€30 or more will receive a $/£/€35 bonus. Claim it three times! On Tuesday from 00:00GMT until 23:59 GMT, all members on their first deposit of $/£/€40 or more will receive a $/£/€45.00 deposit bonus. Claim it twice!